Will the crazy GMO-creations ever come to a halt? Are our crops not enough for biotech? GM mosquitoes developed by Oxitec, a UK company, were already released in other countries as a means to control disease. The company is also trying to release them in the Florida Keys, while working to release GM olive flies in Spain. But it gets even more bizarre – now Oxitec wants to release GM moths in New York. GeneWatch UK has been following Oxitec’s moves and has noted that the company’s GM experiments have not undergone environmental assessment risks at all. The company is a spin off from a multinational seed company, with deep ties to Syngenta. Oxitech claims to be in the business of pest control, but another theory is that they are in the business with other eugenicists for pest creation. Open release experiments using Oxitec’s GE Aedes aegypti mosquitoes are ongoing in Brazil and Panama. Though the GE mosquitoes being released in these experiments differ from Oxitec’s GE agricultural pests in that both sexes of the GE mosquitoes are genetically engineered to die at the late larval/pupal stage. There is no guarantee that this type of genetic manipulation of the natural world would not result in serious ramifications up and down the food chain. For example, if one species of mosquitoes replaces another, more virulent breed of mosquitoes are likely to fill the void, possibly causing further crop damage, and even the spreading of viral disease in humans. The spreading of dengue, or malaria, for example, could become absolutely catastrophic with these genetic manipulations, even though they are being presented as a ‘solution’ to these maladies. Furthermore, birds, bats, and other creatures rely on mosquitoes as a source of food. When a major food source for just one animal is interrupted, it often results in the demise of that species, but it also affects the animals that rely on that species for food. 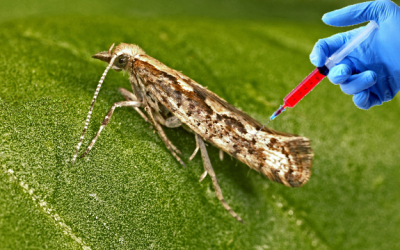 Now, the USDA is considering granting Oxitec a 3-year pass to do open field trials of GM moths, allowing them to release 14 million of these altered pests on crops, meant to destroy other pests that damage broccoli and cauliflower fields. We’ve seen just how great biotech is at pest control with glyphosate – and now they want to start releasing GM bugs? It all seems like a really bad Hitchcock film. This is not a ‘solution’ to any problem. You can bet there is some other agenda underlying all these GM pests, and their release without any scientific study of the long term ramifications of doing so. You can request that the USDA deny Oxitec’s petition here, but this is a much bigger problem than any government corporation (and no that isn’t a typo) could ever allay. She teaches Yoga. I therefore believe she must be a credible source on this complex scientific issue. I’m glad my sleepy little head is awake and I now see the big picture. You must see this completely factual and free video on the end of the world. It gives the full truth about the beasts of the Apocalypse, the kings, the mark of the Beast, the true identity of the Antichrist, Anti-pope Francis and how or whether he fits in with these things and much more. It will change your life. Here’s the link to the video:https://www.youtube.com/watch?v=cn9t0m6eG4Q The website that produced this video is the only place where people will find the essential information they need to know to save their eternal souls in these difficult times. Almost all of their material is completely free to view at all times and they have an enormous amount of the most important information you’ll ever see. They are the only place telling the complete and uncompromising Christian truth as well as the complete truth on the most important secular issues of our time such as 9/11, the prison/military/industrial complex, the Federal reserve and the international usury/banking system, natural health,etc. etc. The full collection of material they make available is the most powerful and compelling information in the whole world. Check it out. They’re coming to get you Christina!